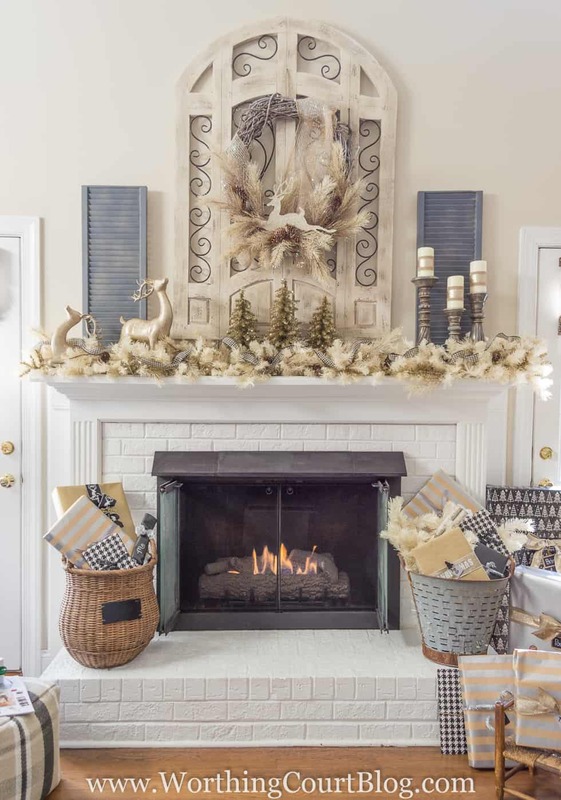 5 Tips For A Magnificent Mantel – Anytime of Year! The mantel in my family room is the focal point of the entire room, so naturally I want it looking its best for all seasons. I’ll share a little secret with you though – if I wasn’t a home decor blogger, I would probably leave my mantel looking the same all year, with the exception of Christmas. But, my mission here is to inspire you and help you to create a home that you love! 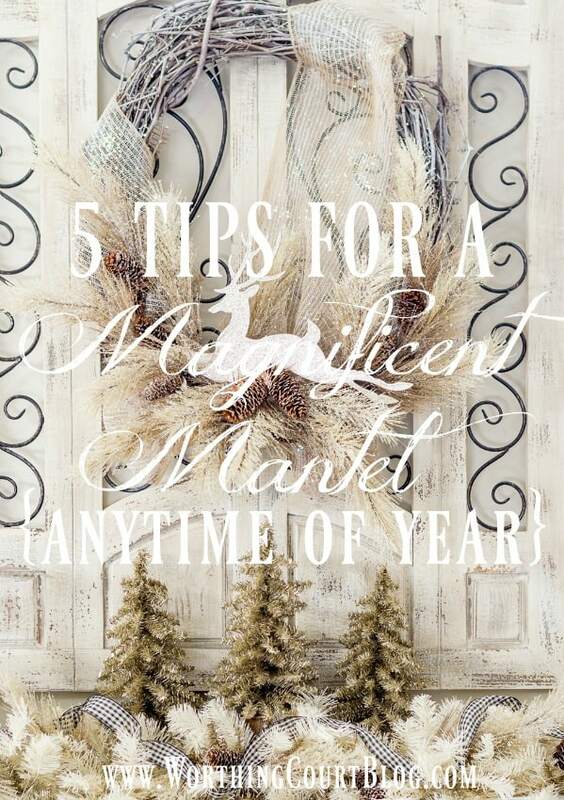 So, with that being said, let me share five tips for creating a magnificent mantel. 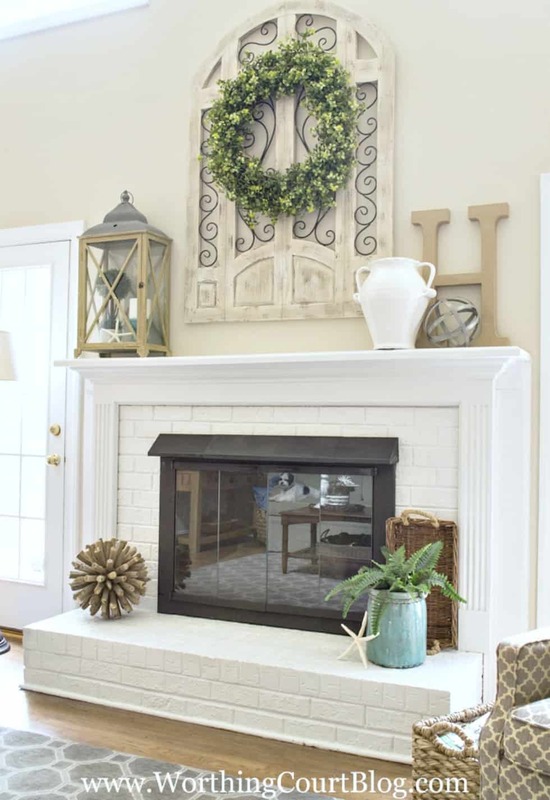 Whether you leave your mantel looking the same year-round or like to change it up for the seasons, these tips will help you get a magnificent mantel that you can be proud of! This post contains affiliate links. If you purchase these products, it allows me to earn a small commission, but there is NO additional cost to you. See my full disclosure HERE. 1. Add a wow-worthy focal point. Yes, your mantel is probably the focal point of the entire room, but you also need a focal point on your mantel. Something that immediately draws your eye to it. It can be one single large item or a collection of items, such as a grouping of frames hanging on the wall. If you’re using a mirror, remember to be mindful of what it will reflect. The focal point of my mantel is a large architectural piece. It stays there year-round and acts as an automatic backdrop for any of the mantel-scapes that I put together. 2. Think about symmetry. Symmetrical or do you prefer asymmetrical? This is purely a matter of personal preference! For me, it depends on what kind of mood I’m in that day. 🙂 If you’re going for an asymmetrical look, a good rule of thumb is to pay attention to scale. Try to balance each end of the mantel with items that are close to the same height and similar visual weight. 3. Add various heights for interest. If everything is one height across the mantel, your eye will tend to just skim across and not take notice of anything special. By using items of various heights, your eye will be able to appreciate what you have on display. 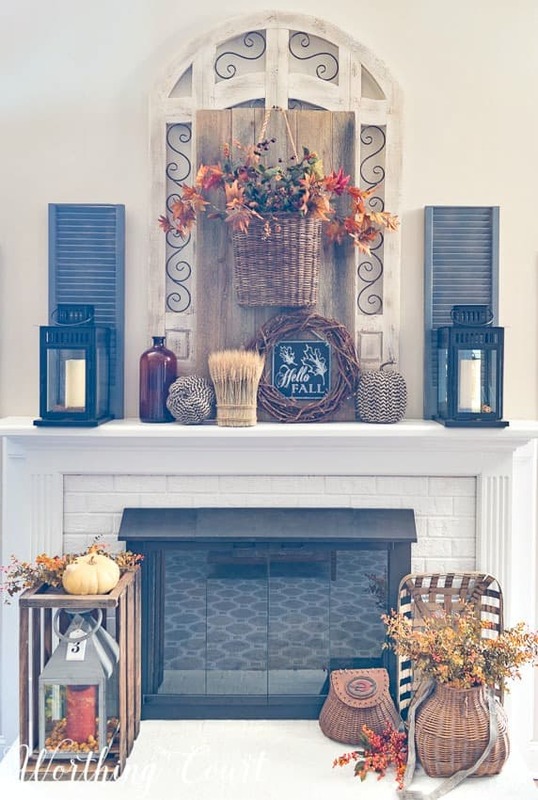 If I were to repeat this mantel and hearth again, I think I’d try switching the two items on the hearth so that I don’t have the tall fall leaf branches directly above the tall tree sticks in the basket. I also wouldn’t have one tobacco basket directly above the other. But the flip side of that is – I’d have two visually heavy items on one end (the lantern and the basket with branches) and two visually light items (the fall leaf branches and the candlesticks) on the other. All good things to consider, so you just need to try different arrangements to see what is pleasing to you! 4. Layer, layer and layer some more! No one can accuse me of being a minimalist. The trick is not to go overboard with too much stuff. My fall mantel this year, is somewhat symmetrical because of the matching lanterns and shutters on each end, but that’s where the symmetry stops. I’ve added layer upon layer of all sorts of different types of decorations. By keeping the theme and colors similar, it doesn’t appear filled with tchotchkes (at least to me it doesn’t!). 5. Tie it all together with color. I purposely decorated my Christmas mantel, tree and wrapped gifts last year so that they all visually worked together. This technique makes quite the statement and works especially well if you’re going for a monochromatic look. Above all else, please don’t stress out and take things too seriously! They’re only decorations – right?. Relax, put some good music on and have some fun! Great tips Suzi and I love the holiday mantels. I change mine with the seasons and it’s the focal point of my small living room. Your Christmas mantle and tree are so pretty! Thanks for the great tips. love the tips for the mantel. Especially showing the seasonal options. Great ideas to change up the mantle. I try to change with the seasons because I like the new ideas and I try to change my house also so it all goes together. Thanks. Your mantel in every season looks so pretty! Thank you for sharing. 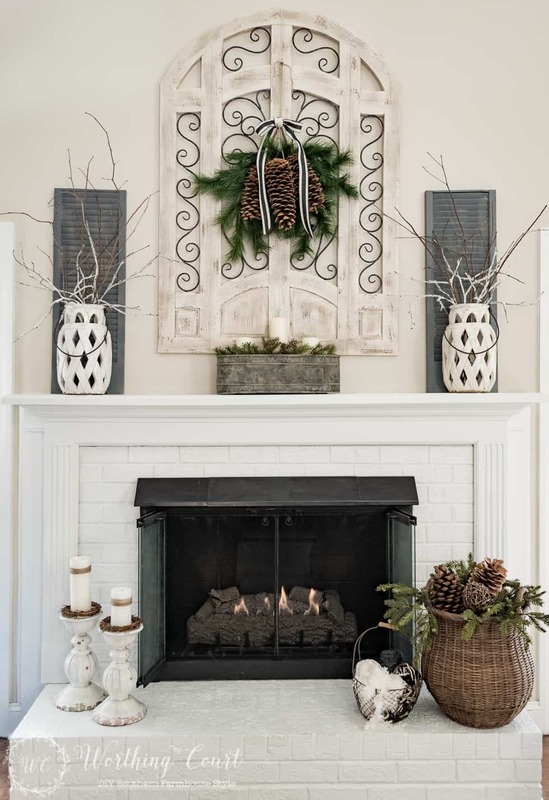 Love the mantel ideas and the tips on how to decorate for the different seasons. Thank you for the tips, and the links! Thanks for all the mantle tips. Now I have no excuse not to decorate mine! Excellent tips. All of your mantels look beautiful. Thanks so much for sharing! Beautiful mantel decor. I would love to have a mantel to decorate even if it was faux. Spectacular! I love them all. The centerpiece of my mantel is my great great grandmother’s mantel clock – I’m so fortunate that my mom gifted me with it a number of years ago. Behind it I have one of the original windows to our 1020’s farmhouse. Right now I have vintage doilies showing through the panes; before that I had a vintage scarf that was a gift from my son and daughter. On the left I have two matching pottery pitchers made by my son. They’re different sizes and I placed a small wreath behind them. On the right I have senior photos of my three adult children and a floral arrangement. Most of this stays the same, although I do swap out a a couple of items at Christmas time. I pinned this – this is so helpful. I’m wanting to redo my mantle and I think with your guide, I finally can get it right! Thank you for sharing your post at the #HomeMattersParty this week. We hope you’ll join us again when the next party goes live this Friday at 12AM EST. I so love all the fabulous tips! Thanks for sharing with us this week at Throwback Thursday! So many great tips and ideas. 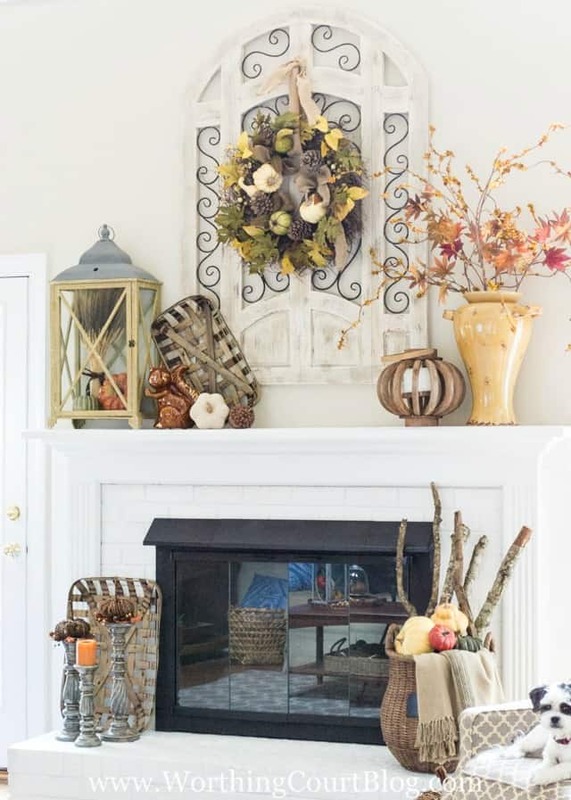 I love fall & your mantel ideas are so pretty. Thanks for joining us at the Inspiration Spotlight party. Shared & pinned for later. I love decorating the mantel for the different seasons/holidays! Great tips too! Hi Suzy! I just wanted to let you know we are featuring your awesome mantel tips at Home Matters today! Thank you so much for linking up with us and we hope you will party with us again! I am currently building my house. These are wonderful tips- I booked marked this for later!! Loved all the ideas…thanks so much….Christmas one is my favorite! Great tips! Love the mantel ideas! Love the architectural piece that is constant through every change of your mantel. That’s an idea that I’d love to use! Love all the tips! We just moved into a house with s mantel and it’s so much fun to decorate! Thank you for sharing all his! I love your mantle—the deer are beautiful & all together it is very serene. Super ideas, Suzy. Thanks for the great inspiration. Love that you provide places where we can go to re-create the scenes! I love your mantel ideas!! Thanks for all the great tips!! I really appreciate that you list the source of decorative items. . . . saves lots of time when I know right where to go to find what I want. Thanks! Thank you fir the great tips! Wanting to revamp my mantel. I really like the garland on the christmas mantel. Is it gold, white or bleached? Hi Judy. The garland is kind of off-white. I purchased it that way. Have a great day! Great tips -I have a tendency to over do my mantle so many times I have to step back and start removing items . Thank you so much for this helpful post. My mantle looks great now! I’ve been looking for a focal point of my mantle . I really want something old but I love your idea of the iron arched peace with the letter in the middle. And I really love your baskets with the gifts on your Christmas mantle and hearth. Thank you for sharing ! Love all your mantles. Will be referring back to this often. Some great ideas! I can’t wait until I have a mantle to decorate! Thank you for this post! Perfect as I transition from my fall mantle to Christmas. One day maybe I’ll have a mantel. I struggle with decorating for the season without one – not enough surface space in my tiny home! 🙂 Thank you for your inspiration and ability to reflect beauty through simplicity. I love your ides. I also have a mantle, but I’m just not a fan of identical items on either side. I’m in love with the neutral mantel. Thanks for the inspiration. Mantles, my favorite throng to decorate. Thanks for the ideas! LOVE, LOVE, LOVE these tips! So glad to know where to find the cardboard letter(s) – have been looking for them. Those tobacco baskets are to die for! They would make an outstanding Christmas gift! Thanks for sharing all this information. I think I am going to have to buy myself a Christmas gift of tobacco baskets!! But I have a large white wood mantel with limestone. A large bluebonnet oil painting above it. And there are many times that I do not know how to decorate that area seasonally because the painting is not coming down. It’s beautiful and cost alot. Any suggestions? It sounds beautiful! If I had a large piece of gorgeous art, that I wanted to keep as the main focus, I’d keep the decorations on my mantel to a minimum. Maybe a group of candlesticks, in varying heights on one side and a single larger vase or urn on the other. Or, if you are a fan of symmetry, you could use the same element on both sides. It seems like either of these elements would draw attention to and frame your painting nicely and not take away from it. If you use a vase or urn, you might like adding some seasonal sticks, flowers, greenery etc to it, depending upon the season or holiday. Hope this helps! I Love each and every mantle and your Christmas tree is Beautiful! My favorite mantle is the last. I really like how you tied it all together. Just lovely! Bought me some tobacco baskets and came back to look at these tips! Hello! I absolutely love your ideas! I aldready found a few! What I can’t find are the shutters. Ive looked at Kirkland’s and Hobby Lobby and no luck. Where did you get them from? Thanks for your help!